Ok, I know that I need an intervention. I am definitely suffering from ODS. 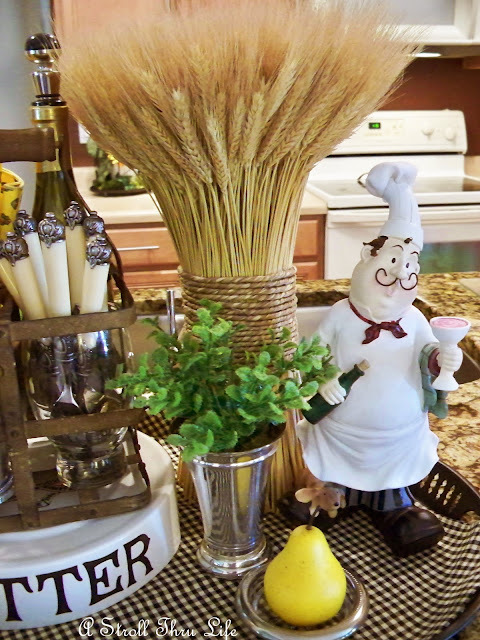 This is the vignette that I did for the island counter, and then things started to change. Some of my favorite things all grouped together, and I took a lot of what I thought were creative pics. Then I discovered that hidden French Linen Tea Towel and of course I had to play again. That meant I had to fix the island since I stole some of the things I had in the original vignette. My cute yellow pig to the rescue. He worked out perfect. Now I can't wait to see what all you've been doing this past week, so show me your creations. 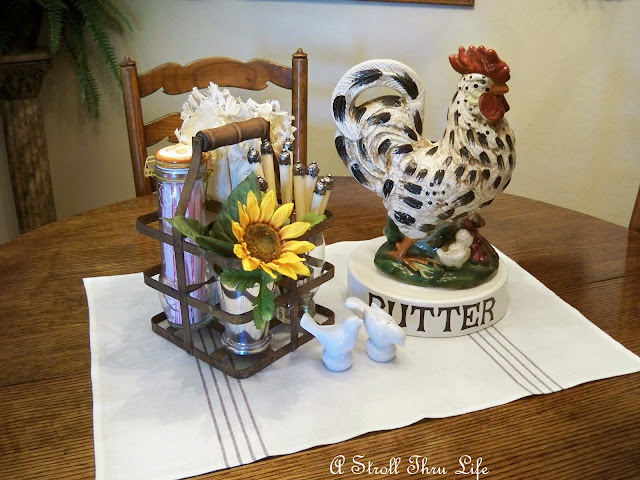 Love your vignettes! That pig is adorable! 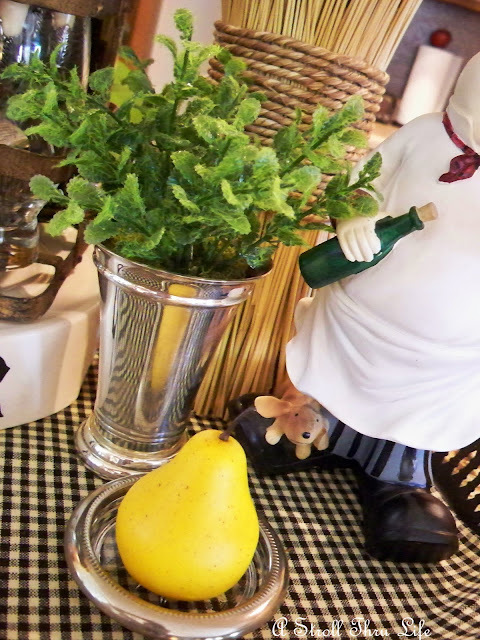 Your vignettes are always cute...I love the little chef guy in these!! Marty, I don't know how you can keep coming up with such cute vignettes, but you do. 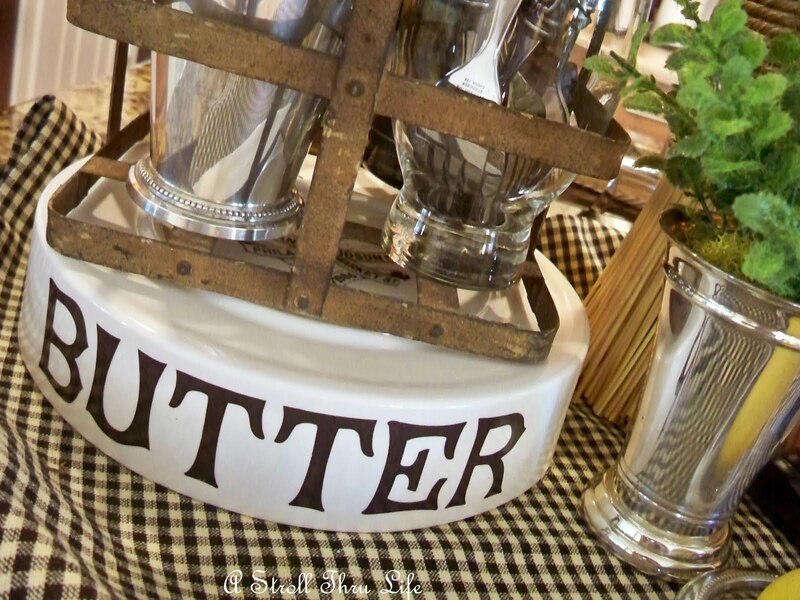 Love the black gingham under this vignette. It's fun to move things are around and you have the best things! I love how you display things so beautifully. You must give us some lessons one day on how you do it. 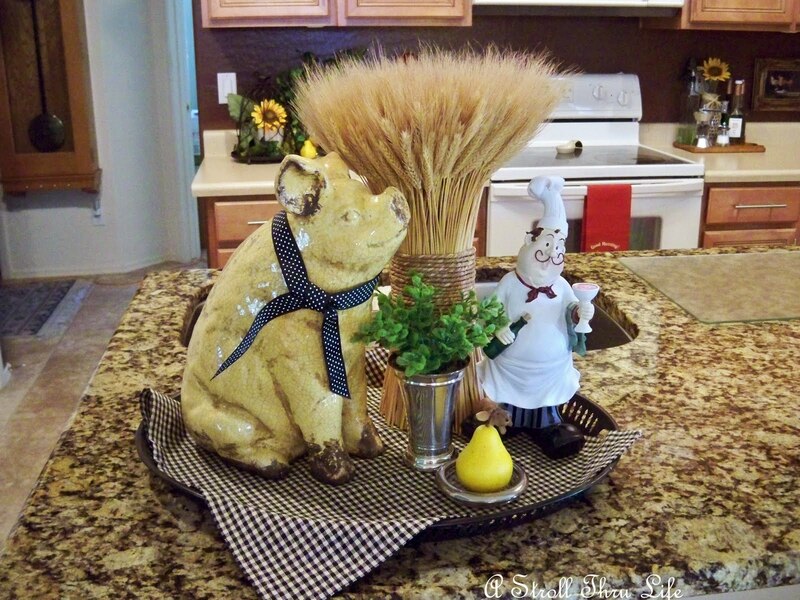 Marty, your touches of silver are so pretty and I love the piggy vignette! You do have an eye for these things. Thanks for hosting. I've said it before and I'll say it again....you create the most beautiful vingettes. Lovely. I think you just have the creative gene and it is just in ya! Your always creating and making, love that! Hugs and only about a month and I'll be hopefully seeing you! 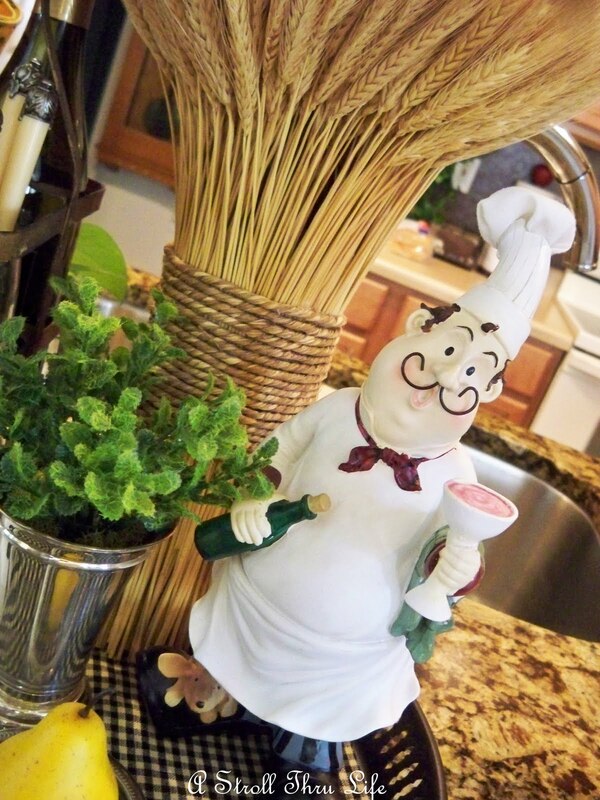 Too cute is that Chef with his wine bottle and glass. . .doesn't he just make you laugh? 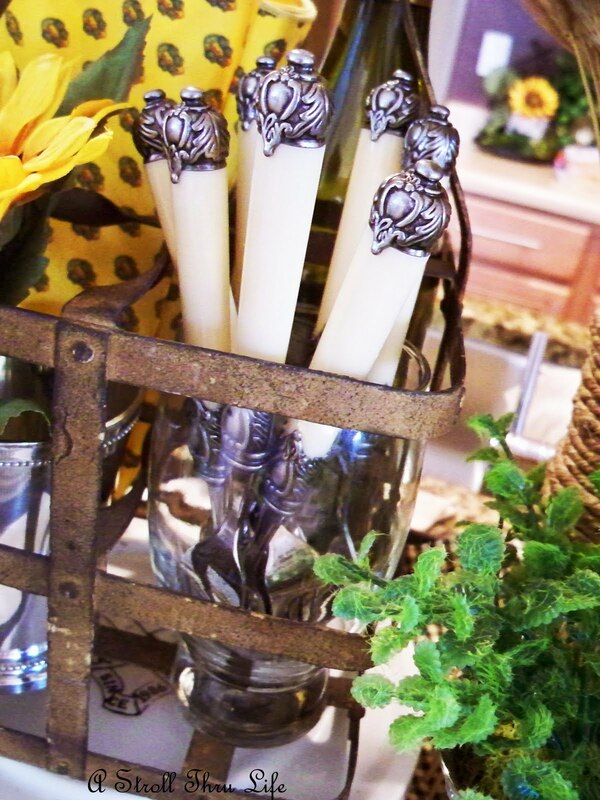 I adore those ivory and silver handled flatware!!! Thank you for hosting this weekly meme and for suggesting I join you! So glad I had a post ready to go! You're my favorite hostess! 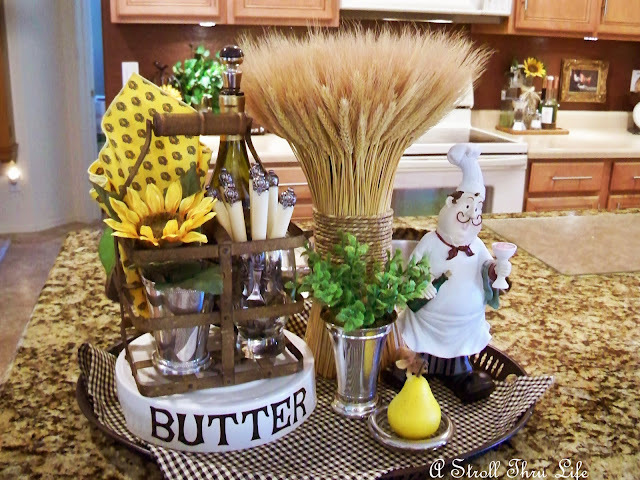 I really think that you should put yourself out for hire arranging beautiful vignettes for people. You definitely have a talent for it! I'd say you sound pretty normal - I think we may need a group intervention! But, what fun it is to come up with different looks. It looks lovely. Oh I suffer from the same thing lots of times!! Just can't keep well enough alone. 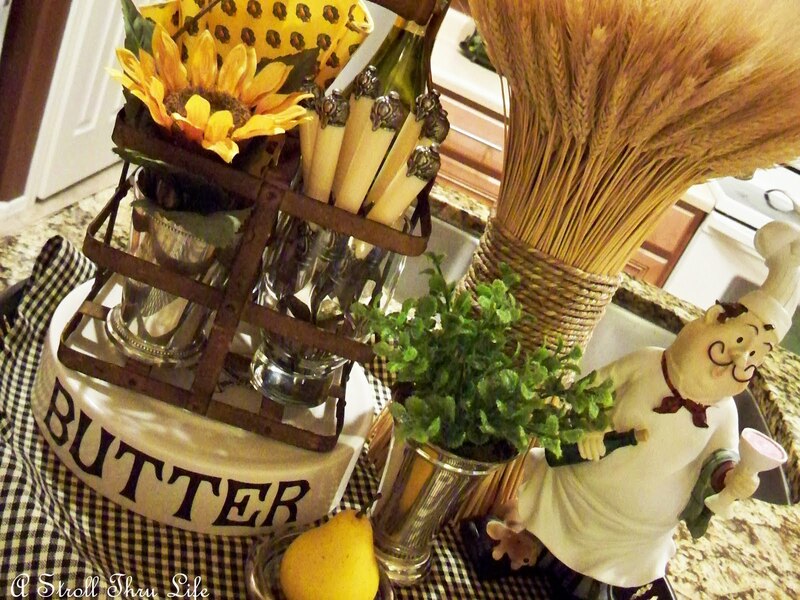 I so love your rusty little crate- it is just adorable and so many ways to use it! So I'm not the only one who "progresses" as I work? !!! Isn't it fun? Hey Marty! All your changes are beautiful! You have a warm and comfortable style! Thanks for hosting! I love the pig. Perhaps he needs a name. 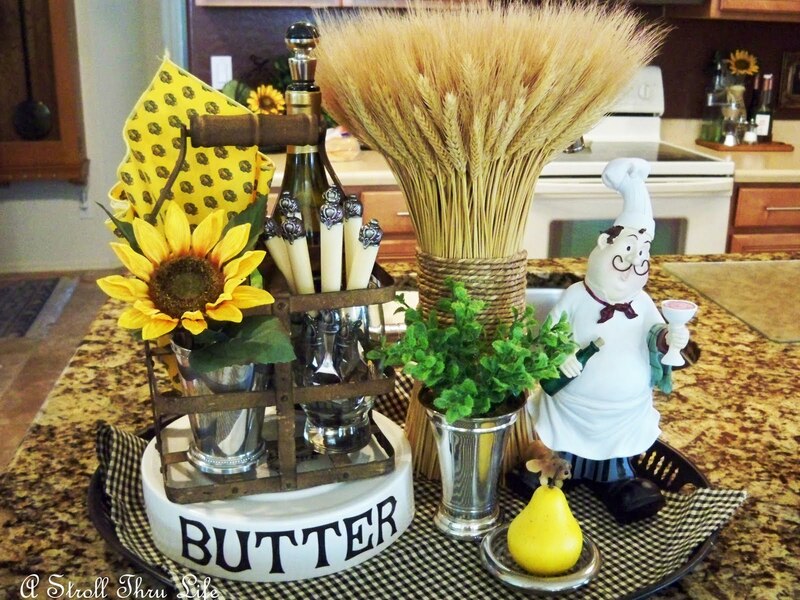 I also love that flatware. Thanks for hosting! Hi, I'm joining in again! As you can see I've also been changing things around! You always do a great job with your vignettes! Love what you did -- you are so clever at vignettes! The new towel looks very nice. Always interesting new vignettes. Thanks for hosting. I wish I had just one hour a day to get to play the way you do every day. GIRL! I love the butter dish with the silverware tray and the cutiepie chef! Such a pretty vignette, Marty!! I'm about to admit something that shows what a doof I am. I have never put a vignette in the middle of either my dining room or kitchen table that I can remember. 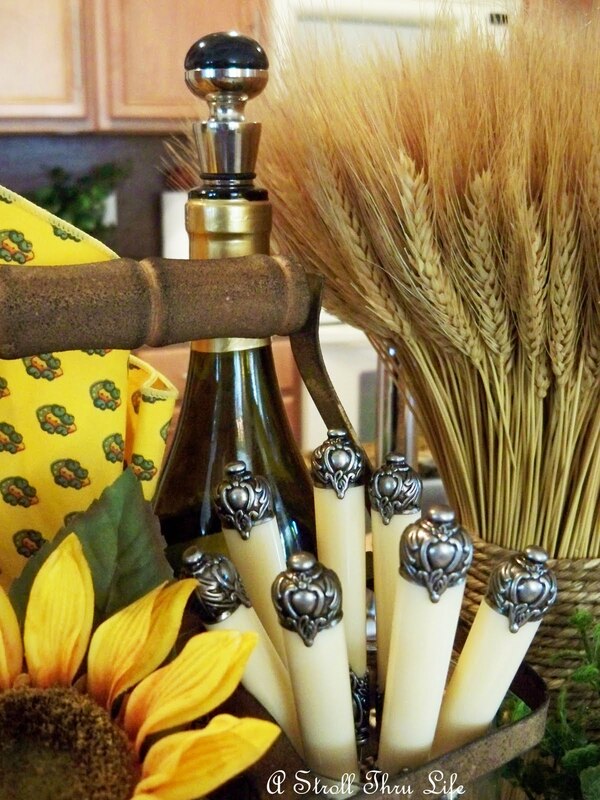 I always put a center PIECE, not something like that. I shall be playing with both tables now. Took me long enough, huh? 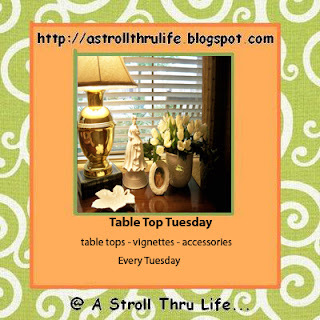 I am so excited that I finally created a few new vignettes in time to play along. Love your beautiful way of display. Every thing looks really cute, Marty. Girlfriend, I would love to have just one oz. of your creativity and energy! Seriously!!! I always stand in awe...of all the different vignettes that you create!!! Ohhh...I love your French linen cloth...it's frenchy fabulous and looks sooo pretty on your table! The vignette that you created for it...perfect (as usual...hehe!) 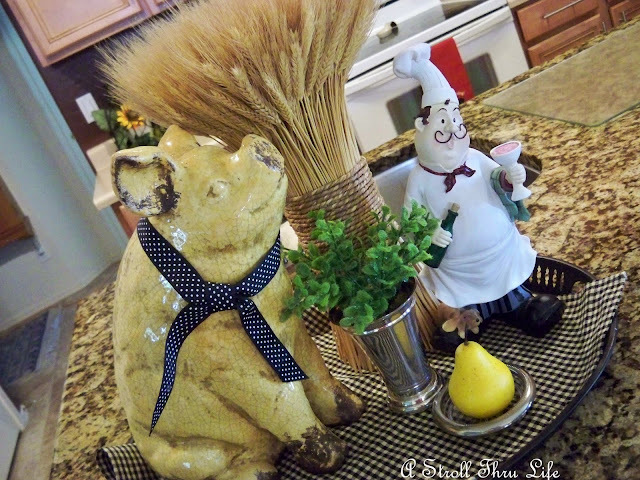 And...I love your yellow pig! He certainly looks french as well! Marty, your photos are gorgeous! Very creative and sooo beautiful! Definitely magazine worthy! I just loved this post! Thank you so much for sharing your new kitchen and table top vignettes with us...it is always a treat! Seriously...I stand in awe, dear friend! Thank you for hosting another TTT! So happy that I could join in this week, my friend! It's always fun to see your changes! I think getting carried away is all the fun! Thanks Marty! 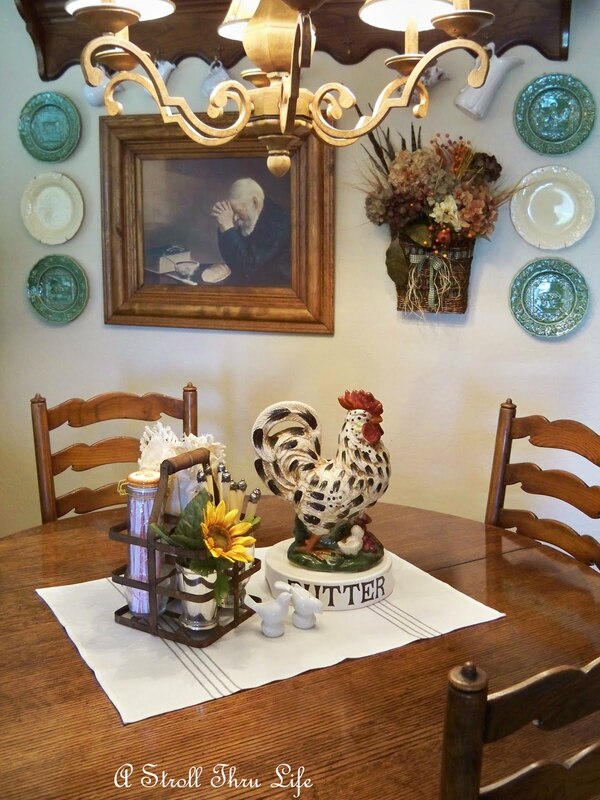 Marty, your changes always look good, but I do particularly like the rooster and wine caddy (?) on your table. Very nice. Thank you for hosting today, too! I just dropped by to wish you a happy summer, my friend. May God keep blessing your life. Isn't it funny how one lil' change leads to another!? Love the changes Marty! Hope your week is going well! Joining your party today, Marty, its a good one! LOVE your metal cutlery holder. I love to see your wonderful vignettes! 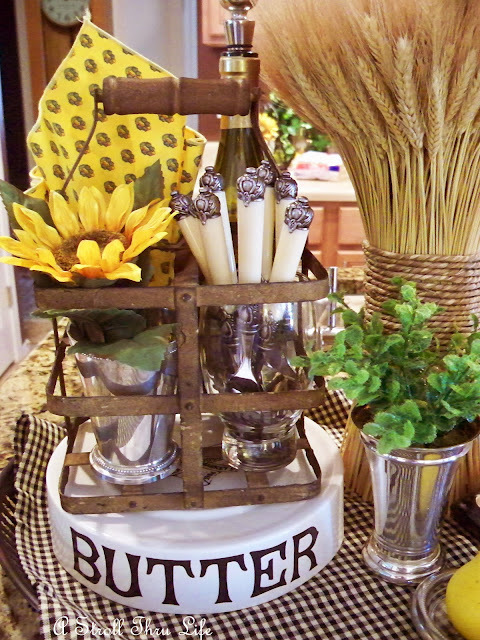 Love that flatware and the sheaf of wheat! Cute! Marty - You are the Queen of Vignettes... and you make me laugh! It is called "the knee bone's connected to..." One thing always leads to another in the creative process! Your vignettes are wonderful ... I hope you had FUN pulling them together. Very nice! I love, love your adorable pig! you are so talented Marty that you could make a living by putting yourself out for hire arranging beautiful vignettes for people all day long ! Thank you for sharing all the inspired goodness !